First, contact support to request Head Teacher status. This status enables you to hide quizzes. Few teachers hide quizzes. Instead, they allow Newsroom 101 to display its full contents and give students an assignment sheet indicating which parts to complete. Ambitious students then have the option of completing the rest of Newsroom 101. 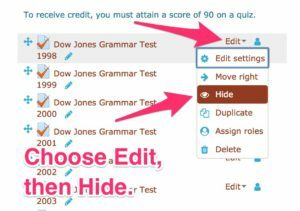 If you hide quizzes, students cannot see or complete them. Hide quizzes carefully and at your own risk. 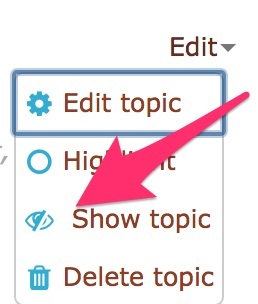 (1) After opening your section of Newsroom 101, click “Turn Editing On” in the upper right. (2) This puts the entire contents into a single long column. To Hide a quiz, use the “Edit” dropdown to the right of its name and choose Hide. DO NOT DELETE IT. You will continue to see the hidden topic grayed out or italicized. It will be invisible to students. Students will not see it in their gradebooks. (3) When you are finished, return to the top of the page and Turn Editing Off. Although it is technically possible to restrict access till a certain date, it is not usually practical because you have to restrict each individual quiz or small unit of quizzes, and there are too many quizzes to make this useful. You cannot restrict access to an entire topic (e.g., Spelling, Dow Jones Quizzes). You can accomplish pretty much the same thing manually by hiding and showing entire topics as your students need to see them. Enter your section and turn on editing. Go down the long list to the topic label “Dow Jones Grammar Tests. 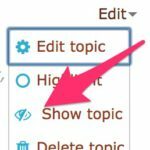 Choose Edit, then Hide Topic. You will see all the affected items change in appearance. Students will no longer see them. Most teachers do not hide and show topics, but you have the option. Keep it simple. Some teachers want to simplify the appearance of Newsroom 101 by hiding the portions they will not require. Students, however, know how to ignore work that they are not required to complete. Be careful. If you delete items by mistake, we probably can’t restore them. IMPORTANT: If a quiz is marked “Review” or “All” and displays a list of prerequisites (with a note beginning “Restricted. Not available unless…”), you MUST assign all the prerequisites in order to assign the Review quiz. You may assign any of the prerequisites, however, without the Review. Go slowly and carefully. Feel free to ask questions. Remember, no matter your impulse, DON’T DELETE an item. Just Hide it. As far as students are concerned, the result is the same. From your perspective, this gives you a large margin of safety.